I understand... Trying to workout for 1 hour a day in this crazy busy life we live is tough. I even find it difficult sometimes. But that doesn't give you an excuse to throw all to the wind and not focus on being active throughout the day. This is why I love my Fitbit! 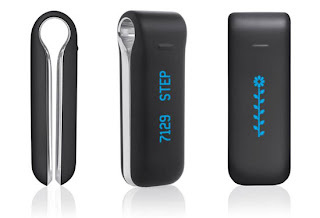 It's a fun, little pedometer that is designed to slide on to your pants. It not only tracks your steps, it also logs the amount of stairs you climb everyday (this is great for me since I work in a two story building), it logs your calories that you burn and how many miles you walked. If you are like me and you use My Fitness Pal or Lose it to track your food and fitness, you can sync your Fitbit to the MFP or Lose It and it uploads all you activity for the day into your app. It differs from other pedometers because it is digital as opposed to the pendulum style. Also, it's just plain ole fun to use and keep track of your fitness and activity!